Today we’re looking for the best computer for music production and recording. So you have the music production gear; keyboards, speakers, microphones, and most importantly, the ideas storming around in your brain. But what about the actual computer to act as the backbone of your entire digital music production setup? When it comes to a music making computer, we want to settle some anxiety you may have right off the bat: it isn’t too big of deal which one you get. When we say that, we mean what kind, type, brand, etc. You will want to follow our checklists for musts so you ensure you have a computer that can actually handle the modern-day digital music production setup; however, there is a vast majority of models to choose from that will work perfectly fine. Your budget – As perhaps assumed, this is our first and foremost the biggest deciding factor. Although you don’t necessarily have to drop thousands of dollars on your music making computer, the higher you go, the better overall quality your work flow will be. 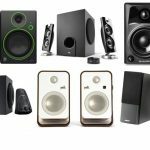 Many reading this article may be just starting to build a home studio, so keep in mind what other gear you need to balance your money out. To have a fast and easy setup however shouldn’t take more than a thousand bucks (and lower). If you’re a starter musician buying your beginners music gear, you may want to save some money and grab a more budget-friendly computer to get going. However, we do recommend saving up as much cash and being as patient as you can, since computers will be a long-term investment for the next 5 or so years. 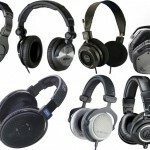 As stated previously, they’re also the backbone of a home studio — without a solid music computer, your other gear won’t even work properly and will be useless. Mac vs. PC? Uh oh, we’re not going to get into this debate. When it comes to music production, this debacle is quite overplayed. You need to understand that in the end both are merely just computers. There is not a preferred “brand” of computer for music making! The only deciding factor for using a Mac or PC (in our opinion) is explained in the next bullet point (or if you’re loyal to a certain route, but that’s not our business). However, you can also read our PC or Mac for music making article for more detail into this popular argument before you continue on. What DAW are you using? Do you have your digital audio workstation picked out yet? If so, this may steer you towards a specific Mac or PC choice. We would only go with Mac if you’re planning on using Pro Tools (they do have a Windows version out now), Garageband or Logic since they are Mac-only. Otherwise, both can work, but double-check on your preferred software’s compatibility. Laptop vs. desktop – Here’s another debate when it comes to computers for music. Nowadays, I’ve heard of producers using laptops at home considering how powerful and capable they’ve become in recent years. One of the biggest deciding factors for a laptop vs. desktop choice is if you’re planning on traveling or performing live. If this is so, we’d grab a laptop since it’ll work amazing for these purposes as well as can hold its own while you’re at home\in the studio making some tunes in between gigs (you can read our music production laptops guide as well). 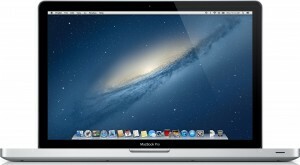 Otherwise, grabbing a powerful desktop PC\Mac has a lot of potential. We have mostly desktop below, so read our guide we’ve just linked in case you’re in need of a laptop — we did sprinkle a few below, too. These are all pre-built – We know many computer junkies out there who frown at those who buy computers that already have their insides picked out. We wanted to mention this last since it won’t pertain to everybody. If you’re in the mood to just get going on making some tunes, pre-built is the way to go. Creating your own music computer does give you some flexibility when it comes to doing a little more work and researching the best RAM, hard drive and processor you’d like to mix and match with (which can probably save you a few bucks in the long run as well); however, many pre-built PC’s in the market are still amazing for recording and producing music, so if you aren’t into learning how to make your own computer right now, it’s no worries. We’ll leave that up to you. If you are indeed into making your own music computer, read our article for an in-depth guide. 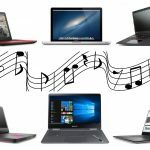 In order to get a feel for what specifications we actually need in our computers, let’s first compare and contrast with some of the most popular music software out there and what minimum system requirements they ask for. We can then use this as a guide to see what the absolute minimum is. Going above is always a good idea since a lot of software out there update quite frequently and sometimes increase their requirements, and you want to be set for the long-term, not just the “minimum”. Let’s review the three most popular software out there right now in Pro Tools, Ableton and Logic. Pro Tools is by far the most demanding software, so if you aren’t using it but still want a computer that supports it, you’ll be in the clear for literally anything else out there. Now that we’ve analyzed the “minimum requirements”, and key word here is “minimum”, let’s organize it al into a checklist for you to use when shopping for the best music production and recording computer. Processors – This is a tough one because a 3.0 GHz processor is a huge difference if it’s let’s say dual core or quad-core. Processor is extremely important (besides RAM or an SSD drive listed below), because it allows us to work in a quicker, more fluid manner, as well as merely to handle the “processes” we need while we make our music. In our opinion, the faster you can work, the more ideas you can get out of your head and into your music canvas. You also don’t want your computer clogging up during a crucial moment of creation, especially if you’re recording and there’s a blip in your track and you have to re-do it all! We would go with at least a 3.0 processor that is at least a quad-core — more specifically, an Intel Core i5 or AMD equivalent. There must be at least 16 GB of RAM. Any higher you go in the RAM department is always a plus, so be our guest. For this year we’ve just increased this from 8 to 16 because Pro Tools now has a minimum requirement of 16 GB! RAM is short for Random Access Memory, which is responsible for storing temporary data to act as the “working memory” of our computer. This is important because just like our processor, music software needs to constantly “work” with each action you partake in, calling for not only “enough” working memory but fast enough so we don’t experience any glitches or lag. At least 500 GB of hard drive capacity– This is up to you, as some say 1TB at least; however, 500 GB is pretty hefty if you aren’t downloading sounds and storing them on the computer or using the device for anything else (such as work, school, images and videos). Keep in mind however a lot of VST software plug-ins and effects are very demanding in regards to hard drive space. We actually use both our internal hard drives as well as an extra external hard drive with about 2 more TB on it (we have thousands of VST’s and samples). Make sure at least some of your hard-drive is SSD (Solid-State Drive)! This is very important because SSD helps process data and requests much faster than regular HDD. Read more about SSD vs. HDD here. A big enough screen to work with (15″ and up), but that really comes down to your personal preference and whether or not you’re on a laptop or desktop computer. We personally couldn’t imagine making music without two for a dual-monitor setup. But that’s your call. We don’t think video cards matter at all unless you’re editing videos on the side. The stock card in most pre-built computers are feasible, since nowadays most computers will come with some great video cards that support most types of video work or video games. 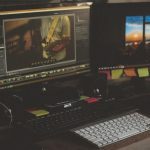 The following list is our recommended 10 best computers for production currently in the market. We made sure to choose a wide range of types. Also understand that there are new models of computers coming out almost weekly now, so don’t let the “this one is new!” label get too into your head. 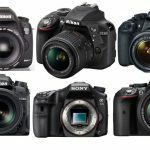 We feel the following models are solid because of user reviews, specs, and overall reputation. Let us know if you have any questions or comments! If you’re planning on being a “studio only” producer (whether you’re home, semi or even professional), here’s the best Mac computer to buy. If you grab one of these, you can use their Mac-specific DAWs, such as Logic, Garageband, and of course Pro Tools. Even if you don’t plan on using Pro Tools right away, you can always upgrade in a few years (we think this will last you at least 5+ years if you purchase a model with a decent specification list). So don’t forget to keep the future (long-term of course) in mind when investing in a computer for music production, considering it’s what holds the entire setup together. If you want a Mac, grab either this or the laptop we first presented and don’t look back, we wouldn’t bother reading on. We link you to a broad search page because there are many iMac versions available and are continued to be released to this day. This is also first due to this — we have options to pertain to our budgets and can mix and match certain specs we need or don’t. 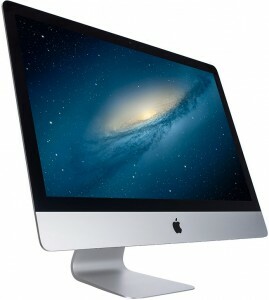 Of course, be sure to use our checklist above when finding the right Apple iMac for you. This is by far the safest pick as the best music making computer in the market today. We’ve done a lot of research and talking to our friends who make music for a living, and when it comes to a PC that isn’t Mac, the name Lenovo continued to come up. Although it really doesn’t matter (really, it doesn’t) which brand you grab, there are a few aspects to take into consideration: user reviews, reports on longevity, brand support, and stats on the quality of internal parts they use. That’s why we feel as compared to some other PC brands like HP, Acer or Dell (although mentioned later), it’s safe to grab one we’ve analyzed and have used personally. Therefore, this is our (our recommendation) choice for Windows PC for producing music. Lenovo builds tanks, and the word among the internet supports that. This may be a bit excessive for some, but can more than handle any process you throw at it to act as the best music recording and production computer out there if you need a Windows machine. 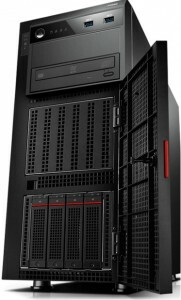 Enter the Lenovo ThinkServer. 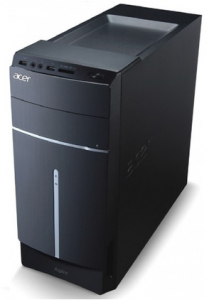 When it comes to the best music making and recording desktop PC, we have a few options. The Acer Aspire is one we couldn’t ignore as another one of the best music production computers due to the reviews backing up its overall quality and build. Depending on which model you grab, there will be very feasible specifications to get your music making going out of the box. You have numerous USB ports for your interfaces and other external pieces of gear, ability to have multiple screens (oh yes, this helps tremendously), a decent weight (it’s a desktop, so in our opinion the heavier the more sturdy), and a wonderful Acer community out there if you need any help. Here’s a great pick for a desktop PC to run Windows with your music making endeavors, and you get some great options to customize to your price-point on top of it all. Here’s the consensus when it comes to the best laptop for music making and recording — The Apple MacBook Pro. Talk to many producers who have a laptop in their setup and they’ll swear by it (if they’re “Mac people” of course). In fact, there will probably be people who scoff at the thought of making music anything but this. You all can have your opinions; however, if you don’t have a strong belief yet and if you want a computer for making music that you’re confident others use, this is one to grab. There are many specification combinations available to fit within your budget range, too (such as screen size, memory capacity, processor speed (for a price) and more). Another big reason we recommend the Apple MacBook Pro first for a laptop-seeker aside from Mac’s obvious reputation is the flat-out performance of these things — they’re sturdy, last a while, come with feasible internal builds (that you can’t customize, though) and more. Lastly, some music software come as mac only, while others both — it’s more likely software and gear are mac-only as opposed to windows-only — something to think about. MacWorld’s article loves the MacBook Pro for music making. Flying under the radar at times (unfortunately) due to the lack of heavily marketed brand names, PC Audio Labs brings us computers literally made for the tough processes of music production. We were unfamiliar with what they brought to the table until a few years ago, but after heavy research and asking around with other producers what their thoughts were, many had zero complaints and actually scoffed at the fact that we recommended any other music production computer aside from these guys. Perhaps labeled as ‘expensive’ by others (you’ll get what you pay for, trust us), especially compared to dinkier machines, their Rok Box series in particular brings us many solutions in not only the personal computer department but laptops as well. They have quite a few models to choose from depending on budget — you can up go to a few thousands to grab a tank, or perhaps just under a thousand for a decent budget-friendly workstation for beginners. They also allow for add-ons for your PC’s internal parts, such as RAM, hard drive and more. Praised by many professional musicians around the world, we’re glad this takes a place relatively early in our best recording and production computer guide. They also have tons and of how-to’s and support videos on their website to help you through out your music journey. We’ve had Dell around our entire lives, and although they had mixed reviews back in the day when it came to quality, the Inspiron series as a whole has been recommended quite a few times when it comes to overall effectiveness, especially for music considering the specs are up there. If you aren’t a fan of Mac and don’t recognize the Lenovo name, we’d grab this one and check out the reviews for yourself. 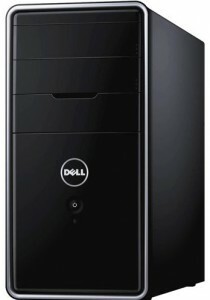 The Dell Inspiron is a highly reviewed and reputable desktop PC for music production. They have decent user support if you ever need (we suppose is a plus), and it doesn’t hurt to have a brand name you’re familiar with. Dell Inspiron help is always available, too. The HP Pavilion is another popular and highly reviewed pre-built computer series in the market right now that brings us great specs and power for handling music production tasks. Widely praised for their compatibility with ‘gaming’, this also gives us confidence music software is viable as well. Again, this is a pre-built ‘series’ (yes, they have laptops as well if you’re a big HP fan), so you can choose a particular model that fits not only your budget but music software’s needs as well. Of course, we require going a bit higher than the ‘minimum’ (a few of the higher models have more than enough, or you can always add-on let’s say some more RAM or hard drive memory later down the road as well). Just another decent computer series here that can act as the best music recording computer if you want a known brand and Windows desktop. These things are tanks. Lenovo is a heavy hitter in the quality department of both laptops and PC’s (we have a few of their models in this article for a reason). The overall build is extremely sturdy (which is one of the main reasons we recommend Lenovo’s to our readers) and they’ll last you for quite a while if you’re looking to invest in a laptop that will be around for a while. Additionally, a lot of these come with SSD (Solid State Drives) which as we’ve stated previously, is a must and a huge plus for convenience and speed (SSD’s are basically less affected by impacts, load apps and your computer quicker, and lower failure rates). What’s even better are the options they give you; you can go as high as you’d like in the RAM and processor department. 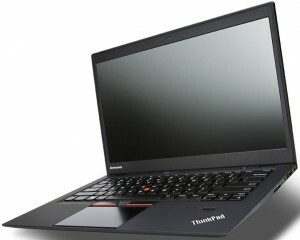 We’ve again linked you to a broad page to see the many different types of ThinkPad’s out there if you wanted one of the best laptops that uses Windows (in our opinion) — we recommend sticking in the middle price-point, fulfilling our checklist above; however, if you can go higher, we’d say go for it if you have the cash. We’re typing on a Lenovo ThinkPad right now. 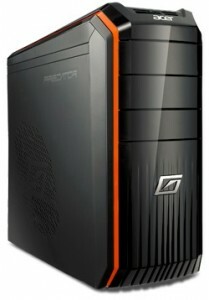 This Acer Predator is considered by many as a “gaming desktop computer”, and although obviously by the video card it is, the processor, RAM and overall quality of the machine works quite well as the best computer for music making, too. 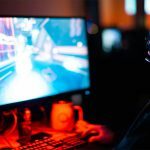 We put this in here because it’s just another option — although the PC’s listed first are more suited (and perhaps a bit cheaper) when it comes to music production (since video cards aren’t necessary with recording or producing), the Acer Predator is a PC to keep in mind while you shop if you indeed plan on perhaps playing games, making videos or other activities on a computer. I mean, it’s not like you’re buying a PC just to make music with (perhaps some of you are), so purchasing a computer that is more of an all-around type may be in your interest. This is Lenovo’s bit of a mix between a laptop and PC. 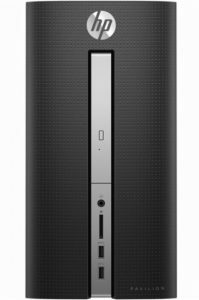 The Lenovo ThinkCentre is considered a “tiny” desktop due to the size, and when it comes to price it’s relatively cheap as compared to many models we’ve listed in here. It’s just another option; you may be looking for an in-the-middle price point and something that fits snug into your existing studio setup. It’s also great for traveling if you plan on setting up a desktop at a friends or stage. 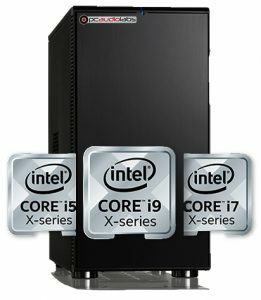 Although we do recommend spending the extra few bucks on a computer we’ve previously listed, the ThinkCentre still brings what we feel are requirements for the “best music production computer” specifications, is by a reliable brand on top of it.